A good attitude to cultivate when someone harms you is understanding they will receive bad kamma. So instead of having angry thoughts towards them you can feel sorry for them and even have compassion for them because they will suffer from the law of kamma vipaka. "There are these five ways of subduing hatred by which, when hatred arises in a monk, he should wipe it out completely. Which five? "When one gives birth to hatred for an individual, one should develop compassion for that individual. Thus the hatred for that individual should be subdued. "When one gives birth to hatred for an individual, one should develop equanimity toward that individual. Thus the hatred for that individual should be subdued. "When one gives birth to hatred for an individual, one should pay him no mind & pay him no attention. Thus the hatred for that individual should be subdued. Two general questions. Why not “mudita”? Also; what is Metta? What is Karuna? What is Upekkha? Which of the five aggregates do the brahmaviharas fall into? And if they are a faculty of one aggregate or another, how do we access them? I know that one repeats, “may he be free from harm. May he be free from harm.” But isn’t it a feeling that we are attempting to engender? Or perhaps a raised level of consciousness. I don’t know. Tell me please. Having developed a mind of good will for seven years, then for seven eons of contraction & expansion I didn’t return to this world. Whenever the eon was contracting, I entered the [realm of] Radiance. Whenever the eon was expanding, I reappeared in an empty Brahma-abode. There I was Brahma, the Great Brahma, the Unconquered Conqueror, Total Seer, Wielder of Power. Then for thirty-six times I was Sakka, ruler of the gods. For many hundreds of times I was a king, a wheel-turning emperor, a righteous king of Dhamma, conqueror of the four corners of the earth, maintaining stable control over the countryside, endowed with the seven treasures1 –to say nothing of the times I was a local king. Definitely. In this day and age, greed has replaced love among even the best of us. As I go through your post however you do not give a clear answer to which of the five skhandas the four brahmaviharas belong. So, you don’t know or you don’t care - or both. The answer is consciousness. The brahmaviharas belong to the consciousness aggregate. This is a tough on for me personally. I am originally from a country that was ripped apart by political violence. I lost family, close family to violence. We were victims to brutal repression and our oppressors are still out there walking free. It is not so easy to let go of these feelings. This will take some time for me to get rid of anger in my heart. If it's not too much to ask, where are you from? I can deeply sympathize because my father was from Chile and was tortured by Pinochet's men turning him into a colder and more angry individual. Such things happen and it's important to remember others will understand. You need to also be kind to yourself, anger hurts you too because it isolates and makes you feel pain. I am originally from Guatemala. My Father was murdered in a rather brutal manner during protest against the military regime in Guatemala in the early 80s. Thousands of Guatemalans were murdered of disappeared. I feel very tense and apprehensive when I encounter other Guatemalans. I only feel at ease around Guatemalans if I know they have similar ideology to my parents, which unfortunately are very very few that I have met here in Canada. Lots of Guatemalans just not many I can relate too. Thank you for your words. I have read a bit about Chile and what they have been through. I actually have met Chilenos here who had to leave Chile because of Pinochet. It is sad what many Latin Americans have gone through and still go through in some Cases. You are absolutely right about anger, It is hurts and is very isolating. It is something that I have to really work on. Again thanks for your words, I appreciate your response. Oh my mother is from Guatemala City, Zona cuatro. And funny you should mention that I relate completely one of my relatives also disappeared in the military regime. My uncle is likely dead, but there is no word from him and it is unlikely we will get that closure. And I understand your apprehension one hundred percent because of it. I hope that you find solace that you aren't alone here. My parents met in Guatemala and then they fled to the United States, as if my dad couldn't have a tougher time. Wow. Thats a coincidence. Sorry to hear about your uncle. Unfortunately too many Guatemalans have a similar story. I am originally from zona 1 right in the heart of the city. Where are you now? It nice to see another person of Guatemalan background on here. 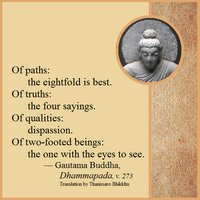 I think Guatemala would benefit greatly with Dhamma teachings and meditation. I know they offer goenka Vipassana courses there. Again thanks for your words. I live in the United States in the Washington DC Metropolitan area. Have had very much fortune to live in a much more peaceful location, but sadly since I can't drive it's harder to get to a Vihara or Dhamma Center. I was lucky enough to make it to meditation classes just this week. I'm happy for the opportunity and I think it's a step forward on my way to healing wounds caused by anger. I'm hoping everyone whose experienced that kind of pain has a chance to find real lasting peace, wherever they may be. But don't worry, there's always going to be hope for Guatemalans to get access to Dhamma talks as long as the internet cafes are still around. I hope there can one day be a strong and well known Spanish speaking monk to disseminate the teachings to Spanish speakers one day and understand a way to deliver Dhamma to a wider audience. I think the culture of Western Buddhism would be enriched by the Hispanic culture.